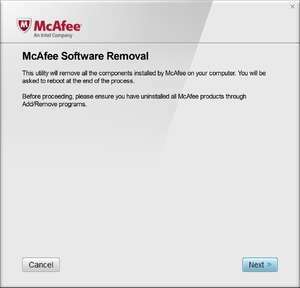 If you've given it a go and figure McAfee products aren't for you, then this free and official McAfee Consumer Product Removal Tool is a way to completely rid your system of McAfee products. The programs doesn't include many features that are selectable for the end-users, but running it will completely rid the system of products like McAfee Antivirus, McAfee Total Protection, McAfee Internet Security and other full products offered by the company. Once the tool has finished its magic work, all products by the company should have been removed from the system and most traces of the application gone. For security reasons, you should also check out the McAfee Consumer Product Removal Tool download at LO4D.com which includes virus and malware tests. Additional screenshots of this application download may be available, too. McAfee Consumer Product Removal Tool download been highly rated by our users.